Quinoa one of my favourite hiking food on the trail. Easy to cook, high in calories and tastes good when spiced decently. Planning for a hike or several days trekking, food is one crucial factor which decides whether you can enjoy being outdoors. I learnt it the hard way through trial and error. 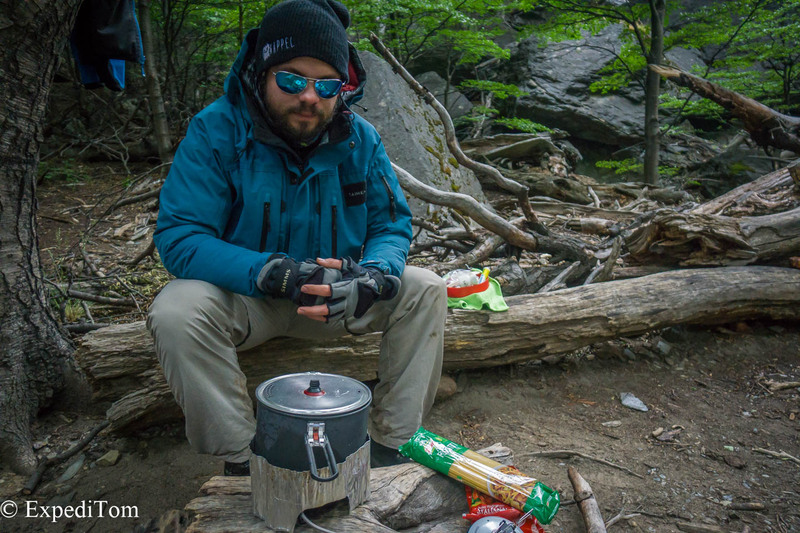 Only recently on the Huemul Trek I felt like being well enough prepared. Or at least not everything went bad – only the polenta. There is an overwhelming variety offered in outdoor stores, but you can save a lot of money by buying in a usual food store if you know what to look for. Therefore, this post about hiking food gives you advice on how to plan for a successful outdoor experience. The messed up polenta. We did not measure the water and so the 3 minute polenta finished in 3 seconds. Before buying any food, there are some considerations to make about the planned undertaking. How long is the hike? How many people hike with you? Might it happen that you are stuck at one part of the trail due to weather or want to stay longer for its natural beauty? Where is the hike? If it is abroad can you bring food into the country or do you have to look for shops? Are you able to gather food on the trail? Do you carry a stove or do you eat exclusively cold food? An alcohol stove might be a cheap lightweight option. After you thought about these vital questions you are able to estimate how much food you need. Keep in mind that there is basic amount of energy that your body needs regardless whether you are active or not. This is called the “Basal Metabolic Rate” and can be calculated here. To this baseline of used calories the planned hike adds the additional calories of the activity. Here is another link where you can calculate the calories burnt while hiking. Apart from the usual daily meals (breakfast, lunch and dinner), plan as well snacks for in between. Another idea is to skip lunch to avoid your heart rate going back to normal and eat snacks throughout the day. Given that you need to carry the food probably for more than a day, the most important factor is the number of calories per weight. In our case, we for food which has 300+ kcal per 100 grams. Food with less energy tends to not suffice for hiking food due to the more weight you have to carry in order to have enough energy. Therefore, fresh healthy foods like apples do not making it into my backpack unless it is for one day. Do not get me wrong. Fruits and vegetables are important in the long-range, but for hiking purpose they do not suffice in terms of calories. To keep your vitamin level up, you should live a healthy lifestyle throughout the year so that your body can handle the short time deprivation. A lightweight alternative are vitamin powders with additional magnesium to avoid cramps and aching. An exemption to fresh fruits are nuts. Nuts have lots of energy and are a great snack for eating on the run. 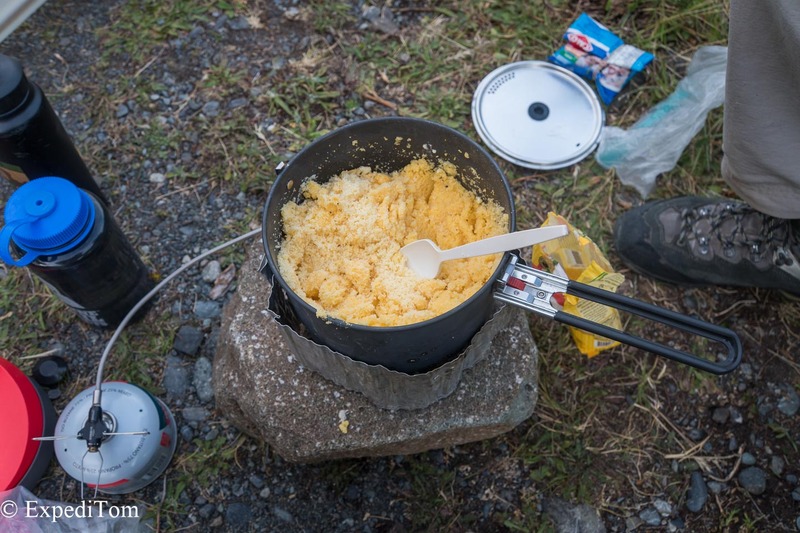 The second feature of suitable hiking food is its boiling time. 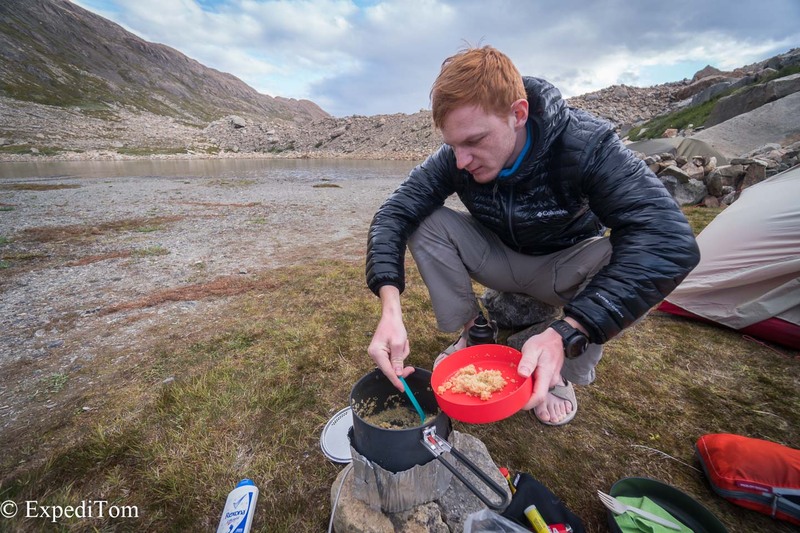 Assumed you will eat warm food, the longer the food needs to boil, the more fuel it will consume which adds up to your pack weight. Whereas Spaghetti have to boil for up to 10 minutes, Polenta and Quinoa can be thrown into boiling water and soak up the water even if it is not boiling the entire time. Another feature of great hiking food is that it can be eaten cold if necessary. This allows you to be more flexible in case you run out of fuel or just have not enough time to cook. A third characteristic of suitable hiking food is its weight. As pointed out above, it should contain as much calories as possible with as little weight. Therefore, almost all foods in outdoor stores are dehydrated. Subsequently, they weigh less. Look for foods that contain as little water as possible. If you the owner of a dehydrating machine, you can produce dehydrated meals yourself. Here you see the list of food we planned to eat on the Huemul trek. Some points may need explanation. The first breakfast on the trail was one of the highlights: Scrambled eggs and bacon. Given that it is difficult to carry eggs in a backpack, we used an empty ketchup bottle to prepare the scrambled eggs in advance. Moreover, given that bacon contains a lot of fat, we did not have to carry any oil for cooking. Best breakfast ever! One of the most useful foods to carry on the trek was milk powder. This allowed us to enjoy muesli for breakfast and it flavoured the porridge better than plain water. 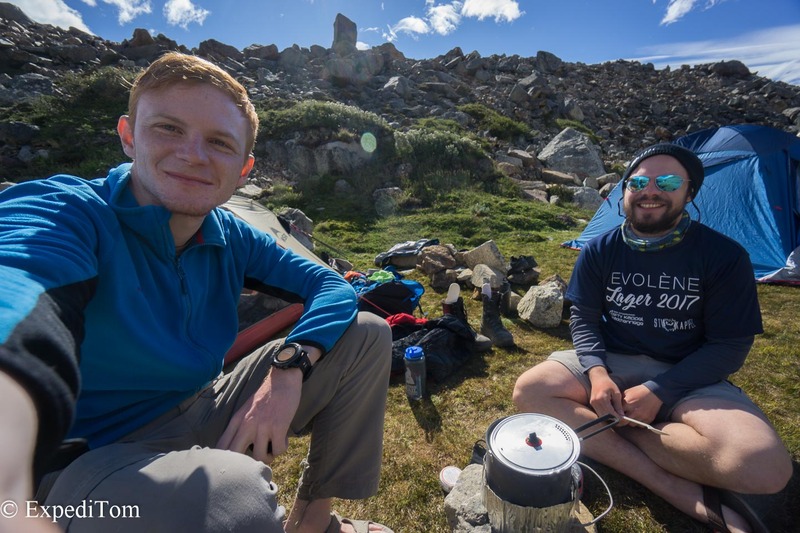 Even tough the Huemul trek takes 4 days, we planned our food to spend an additional day. This allowed us to stay an additional day to relax. However, due to a bad forecast for the coming days, we opted to finish it in time. Therefore, we had some spare food taken back to town. 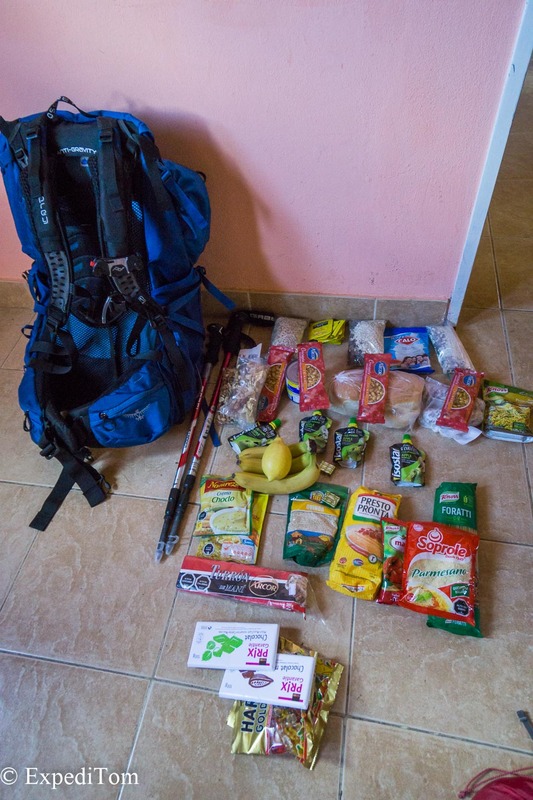 Hiking food for the Huemul trek (4 days, 2 dudes) all lined up.